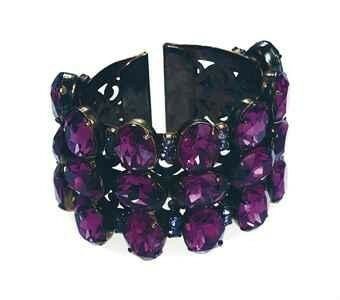 December 15, 2011 – Toronto, ON – US$3,500.00 was the final price for an Alan Anderson amethyst cuff once owned by Elizabeth Taylor in the December 15th on-line auction, The Collection of Elizabeth Taylor: Fashion and Accessories. The ‘rock and roll cuff’ listed on page 232 of the e-catalogue was expected to sell for between US$400 and $600 but far exceeded that when the hammer came down. The bracelet, made up of 21 vintage amethyst stones set on a two-inch wide, rigid cuff with japanned finish was created by Canadian couture costume jewellery designer Alan Anderson in 2007 for a special ‘glam rock’ event at House of Lavande, Florida. “Ecstatic,” is the word used by Anderson in describing his reaction to the final sales figure. “I watched it live on-line and could feel the electricity in the room.” Anderson is not sure how the cuff came to be owned by Dame Elizabeth but from the auction photo he could see wear which would indicate it was worn often.